Quiz: Do I Need A Website? News and announcements regarding UCSF websites, as well as best practices and tips for getting the most out of your web presence. The UCSF A-Z list is one of the best Search Engine Optimization tools at UCSF. Here's how to use it. IT has been providing free, managed, cloud web hosting since 2011. The hosting program has been a larger success than anticipated. In that time, the number of sites we host has increased from 21 sites to nearly 1,000 Drupal sites today. With the increased quantity and complexity of UCSF websites, hosting costs have increased as well. This is primarily due to the added hardware and security measures that IT has added to its hosting service to ensure maximum uptime and security for UCSF websites. All of these services come at a cost which has outstripped our subsidy from the University. To properly resource the web hosting, IT Governance has approved a modest hosting charge for custom websites. That cost will be $50/month for fiscal year 2017-18. Only websites that use a custom theme – including Starter Kit 1.0 websites that have not upgraded to Starter Kit 2.0 – will be subject to the $50 monthly charge beginning July 1, 2017. UCSF Site Builder websites will still be hosted free of charge for the foreseeable future. Find more information about how IT defines “custom websites." IT has migrated over 200 Starter Kit 1.0 websites to a newer design in line with UCSF design standards, called Starter Kit 2.0. Example of an orange theme of Starter Kit 1.0. 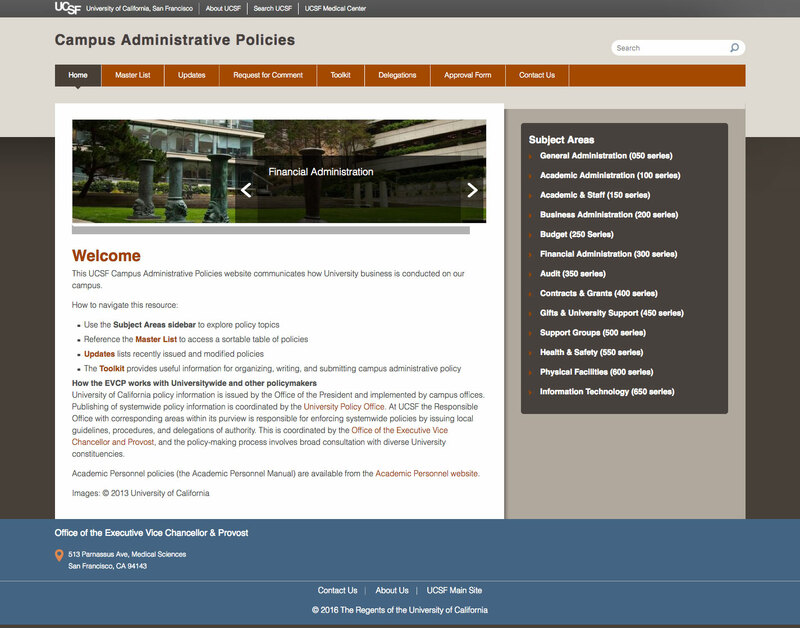 Starter Kit 1.0 sites with the orange theme (pictured right) were not automatically migrated because that theme has been customized. Those site owners will need to manually upgrade their website by following these simple steps. IT noticed a number of websites were missing their Site Name identification on the site and were only showing the default UCSF logo, which is not how UCSF branded sites should look. They tweaked some sites via script to enable the Site Name in the upper left portion of the header. Many sites never updated the Site Name, and it still says “Starter Kit." If the site name is very long, the navigation will be pushed to the right. In this case, you will want to use a shorter name for your site. In both cases, the problem can be fixed by logging into the site as an administrator. Go to Configuration -> System -> Site Information to check and edit your Site Name details. About 193 Starter Kit 1.0 sites have been successfully migrated, and IT expects to complete the remaining migrations by Monday, May 8. For most websites, layout and format did not dramatically change; you should see improvements to the site’s overall look and feel, which include changes to your site’s header region, overall color scheme and homepage. IT has noticed an issue with the main UCSF logo appearing in place of the website’s name in the header section – they are currently working to restore the proper website name to that area. If Starter Kit 1.0 admins haven’t already done so, please check your site asap to ensure there are no other formatting or display issues. If you see any major problems, please contact [email protected]. While IT doesn't anticipate any problems, admins should check their websites after 5 p.m. on May 1 to make sure the upgrade is successful. They may need to make very minor formatting adjustments. Not sure if your website is impacted? Check this list to see if your website is Starter Kit 1.0, Starter Kit 2.0 or Custom. If admins don’t want to wait, they can make the upgrade now by following these simple steps. If a Starter Kit 1.0 website is significantly customized, or if admins see any major problems with their site after the May 1 upgrade, please contact [email protected]. Is there additional information on UCSF websites that would be helpful to you? Send us feedback at [email protected]. Do you have an issue accessing this website? Report an accessibility issue.